In 1991, Dr. Bernard Simon granted the West Milford Environmental Commission an easement donating this 8-acre wetland to the Township. 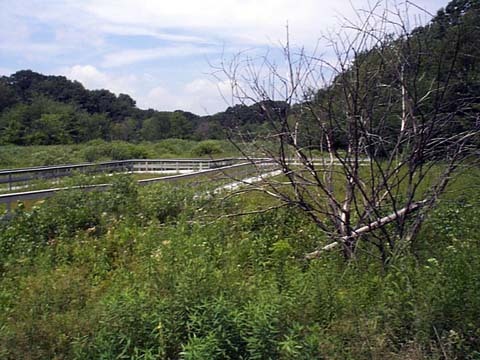 In 1993, through the untiring efforts of Mary Haase, member of the West Milford Planning Board and Environmental Commission, and Roger Daugherty, chairman of the Environmental Commission, a federal Urban Forestry grant was applied for, and awarded to the Township to create this wetlands environmental center. Wetlands, simply, are areas that are wetter than they are dry for most of the year and can support wetland vegetation. In New Jersey wetlands include, but are not restricted to, marshes, swamps, bogs, fens, and wet meadows. Wetlands are important for flood control, recharging underground aquifers, being filters for pollution, serving as habitat for wildlife and having recreational value. New Jersey has the strongest wetlands protection law in the United States. As you walk the boardwalk stop, look, and listen. Observe the ecosystem as a whole. It is dynamic and changing. Imagine what it might look like 50 years from now. Enjoy!